How do we adapt our stance, when coming from riding a twintip, where our feet are strapped to the board. Or for those who already ride a surfboard but strapped? As we have already touched upon with the waterstart & step on beach start, our weight distribution is different compared to a twintip and the lack of footstraps requires us to truly understand how our board, body and kite work together to control the power of the wind. Don't underestimate how much you take for granted having footstraps to hold you onto the board. And though it is relatively easy to ride along, it will take more practice and understanding to be fully in control, through different water and wind conditions. Just riding along is not enough, you need to be able to handle riding at full speed, because you will discover through all these kitesurfing videos that speed is an essential ingredient when you want to ride waves properly. Also when it comes to catching waves, he who can get back up wind the quickest will catch the most waves! So eaking out every bit of upwind potential can be beneficial. The key is a good stance and in this section we are looking to getting that spot on. 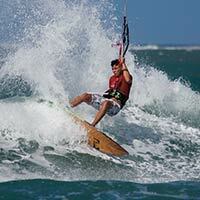 Without it you will be wiping out regularly on flat water let alone when it comes to dropping down the face of a wave. Our first run through will pick out the key areas that you need to focus on before we look deeper in the key elements sections. We’ll focus primarily on stance when you are nicely powered up but give further insight, when necessary, for changes needed in both underpowered and overpowered conditions. Please confirm that you'd like Progression to email you when the new Stance, Control & Speed is available to purchase? You currently have an notification setup for the new Stance, Control & Speed and Progression will send you an email to let you know when it is available to purchase.